Dean Snyder, photo by Scott Lapham. Dean Snyder’s sculpture has been characterized as “uncanny ‘graphical’ organicism experienced through seamless assemblies of highly considered forming, molding, and lamination.” Drawing plays a large role in Snyder’s studio. 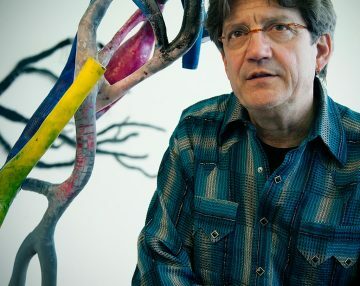 A native of Philadelphia, Snyder received a BFA in photography and sculpture at the Kansas City Art Institute in 1974; a British Arts Council Fellowship for postgraduate work at Lanchester Polytechnic, Coventry, UK, in 1975; and his MFA in sculpture at the School of The Art Institute of Chicago in 1978. Snyder is Chair of the Sculpture Department at the Rhode Island School of Design, where he has taught since 2000. He has received numerous artist awards, including the Guggenheim Visual Arts Fellowship and the Louis Comfort Tiffany Foundation Grant. 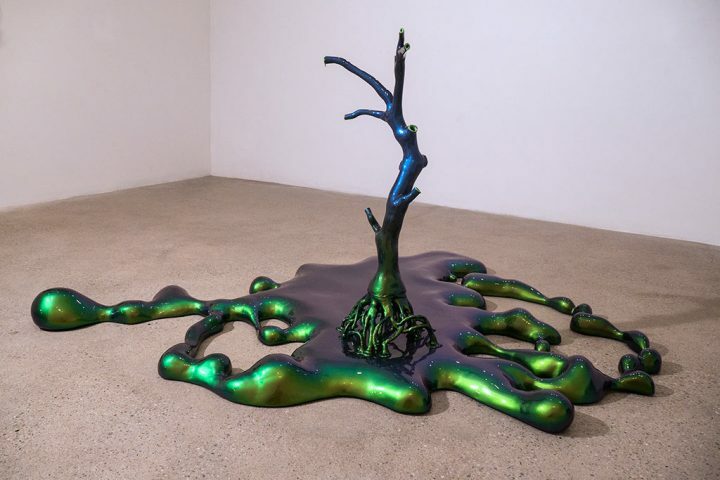 His work has been exhibited nationally and is represented in the collections of the Tang Museum and RISD Museum, among others. Urethane paint over epoxy and carbon fiber composite, 85 x 65 x 37 in.